This is my UVB narrowband lamp unit. It is wall mounted, and housed in a cupboard which I had specially made for it. Patients stand in front of the lamps to receive a dose of UVB to the torso – front back and/or sides, arms, or by raising them one at a time on a chair – the legs. Goggles must be worn as UV is damaging to the eyes. 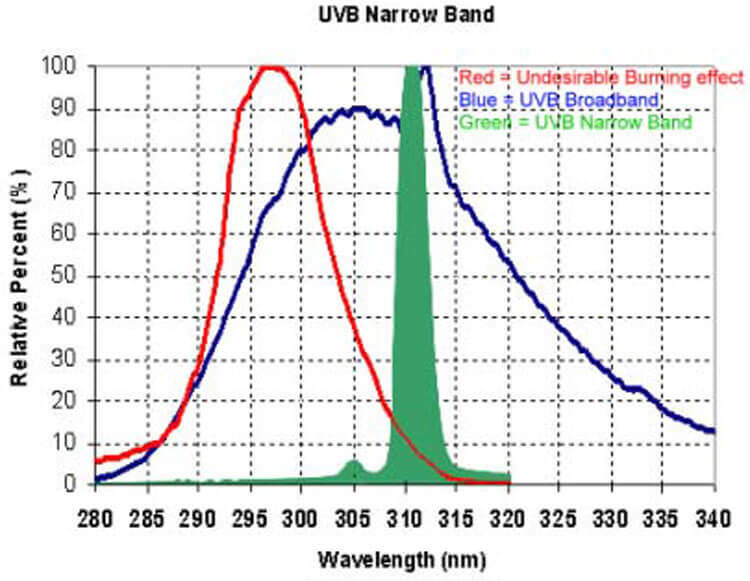 The lamps are medical narrow-band (311 nanometer) UVB fluorescent tubes. This is the wavelength at which vitamin D production is maximised (shown as green on diagram opposite) whilst the harmful effects of UV light are minimised (red on diagram). Although you can see some visible light in the picture above, 99% of the energy is invisible UVB. These are not tanning lights. Tanning salons use UVA broad spectrum tubes – an entirely different class of equipment that has little medical value and carries significant risk. I use my lamps to treat vitiligo, psoriasis and similar skin disorders, for which UV therapy is a recognised treatment, as well as vitamin D insufficiency. In our Northern European climate there are very few days in the summer when we produce sufficient vitamin D, and throughout the late autumn, winter and spring the sun – even at midday- is too weak to produce any vitamin D. Yet vitamin D levels can be increased to or maintained at summer levels using my lamp with as little as 2 minutes treatment per week, depending on your skin colour. To understand how you can make sure you get enough vitamin-D naturally from sunshine in the summer, see my detailed blog post Why April 15th is D-Day in the south of England.